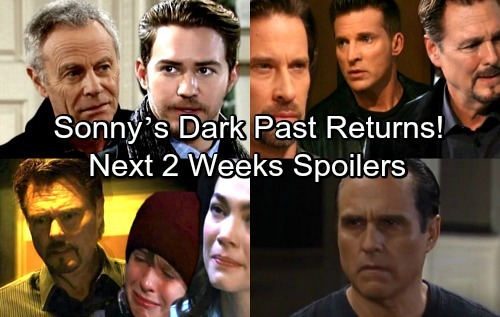 General Hospital (GH) spoilers for the next two weeks tease that things are about to heat up on the ABC soap. The week of April 2-6 will deliver the first round of bombshells. We’ll see some peril for Liz (Rebecca Herbst) and Jake (Hudson West) when they land in the wrong place at the wrong time. Jim Harvey’s (Greg Evigan) missing, so it’s possible they’ll stumble across his hiding spot. Regardless, Franco (Roger Howarth) is sure to be a nervous wreck! General Hospital spoilers say Jason will also have Liz and Jake on his mind. He was worried enough about Franco, but his concerns will really rev up thanks to this incident. Drew (Billy Miller) should hear the news eventually, but he’ll busy with other storylines in the meantime. GH fans can expect more heartbreak when Sam reveals that she’s leaving Port Charles. She’ll tell Drew about her plan to get away from her two loves and hopefully choose the right one after some reflection. Once Sam’s gone, Drew may share some nice moments with Kim (Tamara Braun). He’ll show off a warmer side with someone, so Kim seems like a good fit. General Hospital spoilers state that Kim will spend some time mulling over the past. Since Drew and Sam have split, she may be hoping for a chance with her ex. The week of April 9-13 will bring total terror for Liz. It looks like she may get out of the jam we mentioned, but what about Jake? Could he be injured or swiped from his mom? General Hospital spoilers say Drew will take action later, so maybe he’ll pitch in on a rescue. Over with Sonny (Maurice Benard), he’ll face several dilemmas. For starters, Jason (Steve Burton) will force Carly (Laura Wright) to come clean – at least in a roundabout way. He’ll most likely spill something to Sonny about the scarf chaos. Carly will make a reluctant confession, which will prompt some stunning advice. Sonny will think it wouldn’t hurt to get a professional’s opinion. It appears he may want Carly to seek some help, so Nelle (Chloe Lanier) is already driving her enemy to crazy town. Later, Sonny will have some concerns about his dark history. He’ll feel like it could come back to bite him somehow. Between all that mayhem and Mike’s (Max Gail) Alzheimer’s, Sonny will be dealing with a lot! Finally, Anna’s (Finola Hughes) idea won’t go over well with Jason. It sounds like Anna will summon Robert Scorpio (Tristan Rogers) to help out with the Heinrik hunt. He’ll be back starting Friday, April 13. Anna and Robert may have a new strategy, but it’ll take some work to get Jason on board. Don’t miss the next two weeks of hot drama! We’ll give you updates as other GH details emerge. Stay tuned to the ABC soap and don’t forget to check CDL often for the latest General Hospital spoilers, updates and news.